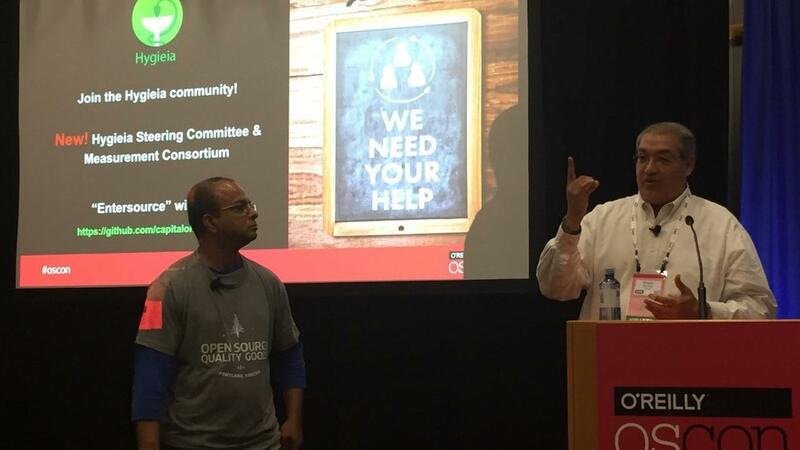 Verizon actively participates in the open source community, and recently joined forces with Capital One to create and announce the latest version of popular open source application Hygieia at the O’Reilly Open Source Convention (OsCon) in Portland, Oregon. Verizon’s IT Senior Manager, Roger Servey, and Capital One’s Senior Director and Senior Engineering Fellow, Tapabrata (Topo) Pal, presented the new and enhanced features of Hygieia, and shared best practices as to how large enterprises can collaborate to not only measure DevOps success, but contribute back to the Open Source community. Hygieia, a DevOps dashboard created by Pal in 2015, was made to help large enterprises with multiple teams manage the development process. The goal for these organizations is to be able to measure the health of DevOps projects in a visual manner, get continuous development feedback, avoid bottlenecks, and more. Software engineers from Verizon and Capital One worked together to understand in greater detail various needs and metrics, and consider different ideas for their own processes and organizations. They partnered to share best practices, lessons learned, pain points and create a solution with the potential to transform the way they operate. Their goal was to help users understand the health of the continuous delivery pipeline from code commit to production deployment bringing all of the necessary information around health and quality of software into one easy-to-use dashboard. The result: Hygieia 3.0, which has new and more impactful features that increase transparency into DevOps-based metrics and enhance reporting. The latest version includes key metrics such as delivery velocity and cycle time, code quality, security vulnerabilities and more. It also now provides near-time visibility into key metrics across an entire line of business offering an executive-level view compared to previous versions which focused on single applications or teams.